Mastalgia literally means ‘pain in the region of the breast’. True breast pain can either be cyclical (getting worse before menstruation) or non-cyclical (unrelated to menstruation). It is important to point out that breast cancer does not usually cause mastalgia. This type of breast pain typically occurs in young women (under 40 years old) in the days preceding each menstrual period. Women often report that the breasts feel heavy, they may increase in size and become generally uncomfortable. The cause of cyclical mastalgia is thought to be hormonal in nature and is related to abnormal fat levels in the blood. 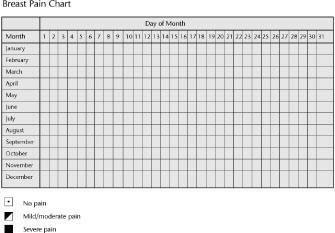 Women suffering from the condition are advised to use a pain chart (see image at the bottom of the page) to assess the duration and severity of the pain to help the doctor make the appropriate treatment decisions. The doctor will usually perform a physical examination and inspect the pain chart. If no breast lump is found, the patient is reassured immediately. Such reassurance is sufficient to alleviate anxiety in the majority of cases. Women who suffer from pain lasting longer than seven days each month can be treated. Simple measures are usually attempted first, including the use of a well-fitting brassiere, a low-fat diet, flaxseed, regular exercise and/or Neurofen (tablet or local gel as required). If these fail to improve the symptoms, then the patient is advised to stop taking any oral contraceptives. If the pain is severe and persistent, then stronger drugs can be used, such as cabergoline (0.5 mg once per week) or tamoxifen (5-10 mg daily). However, these drugs can have significant side-effects such as weight gain, the growth of facial hair, and hot flushes. Tamoxifen (10 mg daily) is the most effective but should not be used for more than 6 months. Cyclical mastalgia usually improves with age. Women with non-cyclical breast pain affecting one breast will require breast examination and they should also have a mammogram if they are over 35 years old. Treatment will depend upon the cause of the pain. Inflammation in the ribs can be treated with simple painkillers, such as ibuprofen (tablet or gel), whereas other conditions, such as angina or hiatus hernia, will require specialist treatment. Wear a well-fitting firm brassiere. Omega 3 and Flaxseed supplements. Try Ibuprofen or Diclofenac cream/gel. If there is a ‘trigger spot’ in the breast, then an injection of local anaesthetic and steroid will relieve symptoms in most cases. Discontinuing HRT may relieve severe mastalgia in some post-menopausal women. If the above measures fail and the breast pain is severe then it is worth trying tamoxifen (10 mg daily), bromocriptine or cabergoline (0.25 mg once weekly) under medical guidance and supervision.